Yesterday I finally did my first all grain brew. It’s been a long time coming and Chas has already done a couple all grain brews. I’ve been putting it off for a while. That’s partly because I was trying to knock out a few batches I’ve been thinking about. The other part was because I didn’t have a pot big enough to do a proper batch. Now that’s all sorted it was time to go all grain. 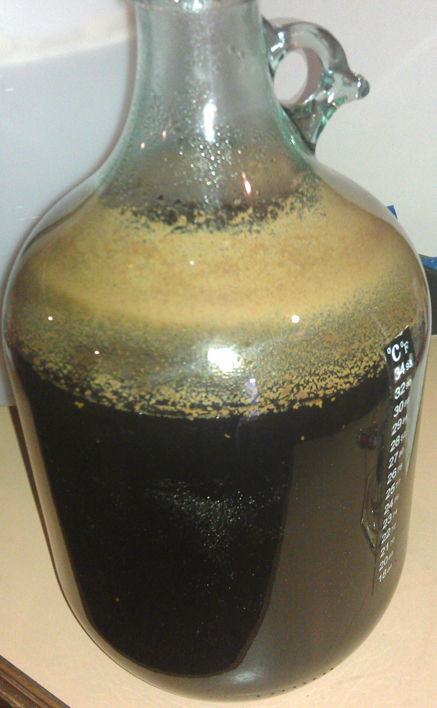 Before I get into that, we also bottled the American Brown Ale. Didn’t bother with bulk priming due to the small batch size. Carbonation drops into bottles liquid in an capped. The final gravity came in at 1.022 which was a bit higher than the 1.014 expected. Final alcohol will be 4.6% and I’m happy with that. So, my first all grain brew was a brew-in-a-bag (BIAB) style. The recipe is part of a Research and Development brew, an American Pale Ale, with a few home brewers from work. The idea is that we all brew with the same grain ratios and IBU target but with different hops. Due to my ‘small’ 19 litre pot I did an eight litre batch, rather than the 16 litre version the others did. Given my fascination in Vic Secret hops, that was the hop selection for me. The recipe is below. The brew was a very long one. Longer than I expected. 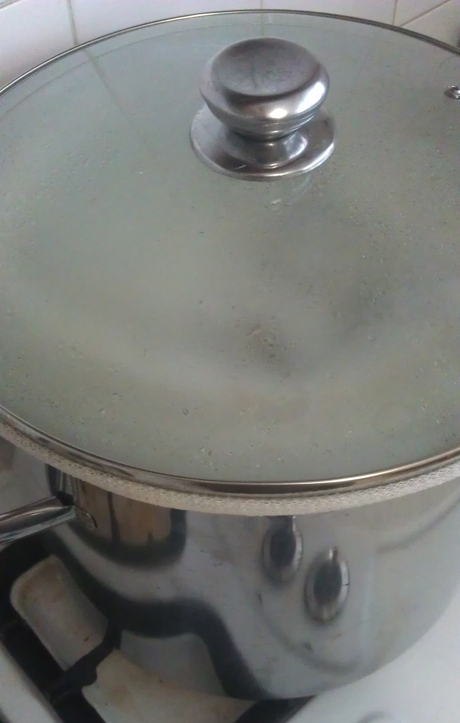 Main reason is it took an hour to get the 14.4 litres of water for the mash. Reason for that was I want to filter all my water before I use it and I didn’t get any prepared before hand. Once water was ready we brought it up to about 69-70 degrees Celsius. Grain bag went over the pot and grain in. This sat in the pot for about 60-65 mins at 67 degrees Celsius. It was meant to be at that for 75 mins but there was too much head added and the last 10-15 mins it got up to about 72+ Celsius. Mash out was meant to be 75 Celsius, so we called it done at that point. There was a lot of liquid that was at the start of the boil. The recipe said it should be about 13 litres. After the boil it was meant to be 10 litres, then batch size of 8 litres. Not sure where the last two litres were meant to go. If anyone has some info on this please post below. Due to the excess water we let the boil go for about 30 or so minuets before first hops. This was to try and reduce liquid, which was a good idea. The hop additions went pretty smoothly. My alarm wasn’t loud and missed a couple additions by a couple minuets here and there. Shouldn’t make much difference. Also used some Brewbrite to clear it out. Added a teaspoon to a cup of water and dissolved it. Then into the boil with about 5 mins to go. Chilled the wort down by putting the pot in an ice bath. This was pretty good. Also added some big blocks of ice to the wort directly which worked a treat. It was only later that I realised this was a problem. Once down in temperature the wort was poured into the fermenter and I realised that I had way too much liquid. It came in at 13 litres! No surprise that the gravity reading came in a lot lower than expected. It was 1.033 and should have been 1.049. That’s a big difference. The re-hydrated yeast went in along with the yeast nutrient. I’m expecting, or rather hoping for, a good conversion from the yeast. If things go well it should reduce down to 1.008 and that means after bottle conditioning It should be about 3.5% alcohol. Will wait and see. Great work Mikey, and welcome to AG! In regards to your pre-boil volume, the only way to really tell what might have gone wrong would be if you took a pre-boil gravity reading. That’s where a refractometer comes in super handy. You only need a few drops of wort to get a gravity reading within seconds. Taking a gravity reading after your mash will tell you your “efficiency”, i.e. how much sugar you’re extracting from your grain. You can then plug that efficiency figure into your brewing software (e.g. Beersmith), so that next time you can adjust your recipe to hit all the right numbers. I find my efficiency with BIAB is about 68%. You also need to configure your recipe for your equipment. With my boil pot, I leave around 4 litres of wort behind post-chill, as it contains most of the break material/kettle trub. So if I’m after 17 litres in the fermenter, I actually want 21 litres post-boil volume. It’s fiddly setting all this up at first, but once you’ve got it right you rarely have to change it. My guess on the last 2 litres is the recipe is accounting for volume loss due to your trub. Most recipes I reference assume a loss left in the pot so as not to transfer this into your fermenter. Great job on your first all grain brew! I do BIAB as well and it works out great.